Recent images of Titan from NASA's Cassini spacecraft affirm the presence of lakes of liquid hydrocarbons by capturing changes in the lakes brought on by rainfall. For several years, Cassini scientists have suspected that dark areas near the north and south poles of Saturn's largest satellite might be liquid-filled lakes. An analysis published today in the journal Geophysical Research Letters of Titan's south polar region reveals new lake features not seen in images of the same region taken a year earlier. 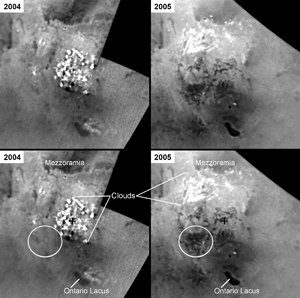 The presence of extensive cloud systems covering the area in the intervening year suggests that the new lakes could be the result of a large rainstorm and that some lakes may thus owe their presence, size and distribution across Titan's surface to the moon's weather and changing seasons. The high-resolution cameras of Cassini's Imaging Science Subsystem (ISS) have now surveyed nearly all of Titan's surface at a global scale. An updated Titan map, being released today by the Cassini Imaging Team, includes the first near-infrared images of the leading hemisphere portion of Titan's northern "lake district" captured on Aug. 15-16, 2008. (The leading hemisphere of a moon is that which always points in the direction of motion as the moon orbits the planet.) These ISS images complement existing high-resolution data from Cassini's Visible and Infrared Mapping Spectrometer (VIMS) and RADAR instruments. Some of the north polar lakes are large. If full, Kraken Mare -- at 400,000 square kilometers -- would be almost five times the size of North America's Lake Superior. All the north polar dark "lake" areas observed by ISS total more than 510,000 square kilometers -- almost 40 percent larger than Earth's largest "lake", the Caspian Sea. However, evaporation from these large surface reservoirs is not great enough to replenish the methane lost from the atmosphere by rainfall and by the formation and eventual deposition on the surface of methane-derived haze particles. "A recent study suggested that there's not enough liquid methane on Titan's surface to resupply the atmosphere over long geologic timescales," said Dr. Elizabeth Turtle, Cassini imaging team associate at the Johns Hopkins University Applied Physics Lab in Laurel, Md., and lead author of today's publication. "Our new map provides more coverage of Titan's poles, but even if all of the features we see there were filled with liquid methane, there's still not enough to sustain the atmosphere for more than 10 million years." Combined with previous analyses, the new observations suggest that underground methane reservoirs must exist. Titan is the only satellite in the solar system with a thick atmosphere in which a complex organic chemistry occurs. "It's unique," Turtle said. "How long Titan's atmosphere has existed or can continue to exist is still an open question." That question and others related to the moon's meteorology and its seasonal cycles may be better explained by the distribution of liquids on the surface. Scientists also are investigating why liquids collect at the poles rather than low latitudes, where dunes are common instead. "Titan's tropics may be fairly dry because they only experience brief episodes of rainfall in the spring and fall as peak sunlight shifts between the hemispheres," said Dr. Tony DelGenio of NASA's Goddard Institute for Space Studies in New York, a co-author and a member of the Cassini imaging team. "It will be interesting to find out whether or not clouds and temporary lakes form near the equator in the next few years." Titan and the transformations on its surface brought about by the changing seasons will continue to be a major target of investigation throughout Cassini's Equinox mission. The Titan map and images of the lakes are available at: http://ciclops.org, http://saturn.jpl.nasa.gov , and http://www.nasa.gov/cassini . The Cassini-Huygens mission is a cooperative project of NASA, the European Space Agency and the Italian Space Agency. The Jet Propulsion Laboratory (JPL), a division of the California Institute of Technology in Pasadena, manages the Cassini-Huygens mission for NASA's Science Mission Directorate, Washington. The Cassini orbiter and its two onboard cameras were designed, developed and assembled at JPL. The imaging team consists of scientists from the U.S., England, France, and Germany. The imaging operations center and team leader (Dr. C. Porco) are based at the Space Science Institute in Boulder, Colo. The Applied Physics Laboratory, a division of Johns Hopkins University, meets critical national challenges through the innovative application of science and technology.